Scavenger Hunt list for an Animal Shelter Scavenger Hunt. An Animal Shelter Scavenger Hunt is a great way to help the animals in your city and also have fun! Use the provided free item list to collect items from neighbors and friends and then take them to the Animal Shelter and donate them to help dogs and cats in need. Great for all animal lovers!! Print out a copy of the Animal Shelter Scavenger Hunt List for each team. A good ideas is to separate into 2 teams and team A goes to houses with even street numbers and team B goes to houses with odd street numbers. This will eliminate teams going to the same house twice. Give each team a wagon or wheelbarrow to carry the items they collect. Teams ask neighbors and friends if they have any items from the list that they would like to donate to the animal shelter. When an item is collected then it is checked off the list. The team who collects the most items wins a prize! Call the SPCA or Animal Shelter in your town to find out what their specific needs are and add them to the list. If you would like to use it on a website please give us a link back at Birthday Party Ideas 4 Kids - thanks! Items should be used but in clean / fairly good condition. Extra points for finding more of each item. Give points for items donated that aren't on the list too! 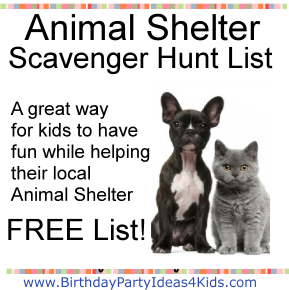 The Animal Shelter Scavenger Hunt is a fun birthday idea for kids, tweens and teens! Give teams a plastic container to collect spare change - quarters, nickels and dimes add up! Donations - ask for spare change they might have to donate.